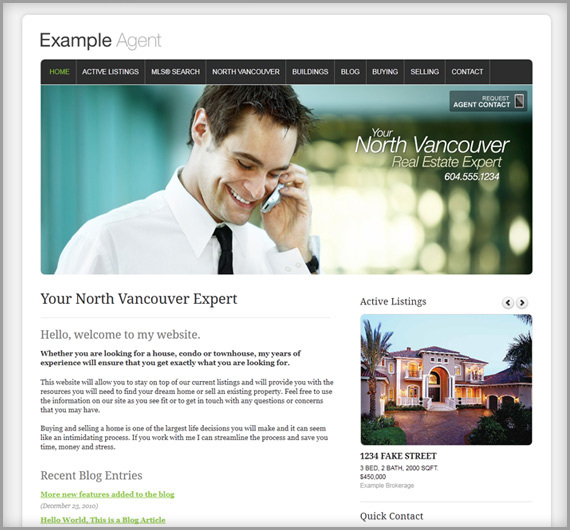 In our quest to provide you with the sexiest real estate websites possible, we have released a new theme available to all RealtyNinja users free of charge. We are calling this new theme “Classic” and it’s super clean, user-friendly and minimalistic. View the new theme in action on our example website. To change your theme, login to your website and click the “Edit My Website” tab. On the right side you will find a dropdown menu with a list of available themes. Simply select the theme and presto! you are now using it. None of your data is changed so you can easily switch back to your old theme if you prefer. Keep in mind that if your logo/banners have been designed primarily for a dark theme, they may not look perfect on the new light “Classic” theme. But fret not! Simply send us an e-mail or give us a call and we will help transition your graphics to the new design. We made 3 versions of link and navigation colors: green (default), red and blue. Let us know if you would like a custom color combination or banner image for your website, free of charge for our existing customers. Look forward to more themes and variations coming in the near future. If you have any questions feel free to email us any time at info@realtyninja.com and we will be happy to assist you. Keep an eye out for product updates, news and general updates from RealtyNinja.